It’s time to say goodbye… and hello! I don’t even know where to start, but today I say goodbye to Doris Loves. It has been a difficult decision but ultimately the right one for myself and my family. Don’t panic though Doris Loves has been purchased by the lovely Emma who will be taking her on and giving her the time she really needs! Creating Doris Loves and growing it into the business it is today has been such a fun ride, of course there has been stress along the way. What job doesn’t come with some! But SO SO SO much fun to. I have been SO lucky to have met SO many wonderful couples and seeing photos of our products in action at their weddings will be a joy and excitement I will dearly miss. I will miss attending weddings and events and applying temporary tattoos to guests. I will really really miss exhibiting at wedding fairs; talking to all the lovely couples and AMAZING business owners I have had the pleasure to meet and become friends with over the last four years. I will also miss putting together photoshoots and spending the day with awesome photographers and collaborators whilst creating beautiful images! It has been an amazing and unexpected rollercoaster ride but unfortunately it’s time for me to get off! In the four years since I created and grew Doris Loves, my personal life has been somewhat hectic. I had a rather difficult and heartbreaking journey to motherhood. I left what i thought would be a life time career in teaching. I became a Mum of not one, but two beautiful daughters. Oh and brought a run down bungalow and started to extend it with a toddler and a five month old in tow! My plate is somewhat full and the stress of the buck ALWAYS stopping with me, has just become too much. For my own sanity and to indulge my desire to spend not more time (I already spend all week with them!) but more quality, head free time with my daughters. Now is the right time to sell up and move on. So I can really enjoying them and life. Luckily this four year period has also seen my husband’s Architectural Business; Spitfire Architecture grow into a strong and extremely busy practice. Therefore once the dust has settled and I’ve enjoyed some much needed time off, I will join forces with Darren once more but this time in continuing to grow and develop his business. I shall take SO many things away with me from Doris Loves (don’t worry not any stock Emma!) a sense of self belief and confidence from starting and now selling a business from nothing. A whole bunch of friendships. And a much stronger relationship with both my sister and husband who have worked alongside me and not only encouraged the businesses growth but help create it! SO with the BIGGEST thank you to Darren and Holly and a MASSIVE MASSIVE thank you to EACH and EVERY person that has hired from us and made the last four years such an awesome journey. And with a huge geometric heart shaped glow, it is farewell from me. And heaps of good luck to Emma. Hi I’m Emma – OMG I’ve just bought a company – Doris Loves!! I am extremely honoured to have this opportunity from Amanda as I know how much Doris Loves means to her. Amanda – I promise that I will take good care of her and hope that you enjoy seeing the continuing journey of Doris Loves (If not, I’m sure you will hunt me down!). I would also like to thank Darren as well, because without him Doris Loves would not be! 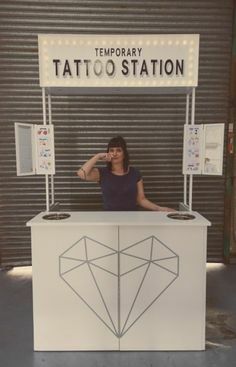 I’m being handed the reigns of Doris Loves at a great time in a fantastic position (all thanks to Amanda and Holly) with unique light up letters and just the most awesome tattoo station I just can’t wait to get out there and meet you all. Who knows what is round the corner?!?! Well howdy! Welcome back to the Doris Loves blog in time for a brand new “Getting to Know You…” and this week we’re meeting the lovely Sorrel from Sorrel and Steve vintage prop hire!! Be sure to read all the way to the bottom as Sorrel has some fabulous advice for bride and grooms to be! Q. Well hello there! How the devil are you? First things first… who are you and what do you do? A. Hello lovelies! My name is Sorrel and I’m the creative director of Sorrel & Steve prop hire and styling. In case you’re wondering, Steve is not a dog or a boyfriend, he is my dad, I included his name in honour of my parents who have helped me enormously in getting this far, but also because I thought it sounded cute!! Sorrel & Steve is a creative, design-led prop hire business, specialising in antiques and vintage items sourced from all over! We have everything from vintage china for afternoon tea to an antique Italian easel to display your table plan! Q. And how did you get into the prop-hire business? A. After graduating from Chelsea College of art and design I interned in interior design and styling, while working on a photoshoot I dealt with a lot of hired props to style the sets and realised what a wonderful idea that was, you could have the perfect item for that event without having to store it or always reuse the same old props. And well I’m a girl through and through so I’ve always been obsessed with weddings! Q. What do you enjoy most about being the boss at Sorrel & Steve? A. I love having design freedom and the challenges, when a bride asks for something specific I’m like a kid on an Easter egg hunt, so excited to go out there and source the perfect items for them, when I find it it feels like such an achievement! Q. If you could jump on a plane tomorrow… where would you go? A. I love doing a city break and the top city on my bucket list is San Francisco, I love architecture and wandering the streets discovering hidden gems, café’s and hopefully more antiques to add to my ever-growing collections! Q. It’s Sunday… what’s your all-time favourite thing to be doing? A. I love an antique or flea market, I’m slowly making my way around the country! But I’m also a huge fan of a rainy day watching movies by the fire cuddling my gorgeous nephew with lots of tea and chocolate! A. I’m currently obsessed with the programme ‘American Pickers’ it’s about these two guys from Ioha who travel around America in their van finding back roads and strange deserted places where people live with their barns, warehouses and front yards full of old antiques and memorabilia, they find the coolest stuff, I’d love to do something like that some days! Q. You’re home alone… guilty pleasure song: go! A. Too many to choose from!! But probably a One Direction, their songs are just so catchy! Q. Which would you rather be: a care bear or a unicorn?! A. Oooo tough choice, although my current phone case is covered in glittery unicorns I’m probably gonna go for Care Bears, I loved them when I was little, I had their movie taped off the telly and a birthday cake with a Care Bear on! Q. Do you have a top tip, hack or any advice for brides and grooms planning their big day? A. From a styling perspective, although I’m totally Pinterest obsessed I would say find the things you like and choose your favourite few, stick to the big things don’t get carried away with the little cute stuff too much because on the day you wont have the time to notice it! From a relationship perspective plan it together, I know it’s easy for the little girl within you to get super excited about making your big white wedding dream come true but the best weddings I’ve been a part of have been planned as a couple, thinking about what you both love and having the day reflect you both. It’s not ‘my’ wedding it’s ‘our’ wedding! And of course ENJOY it, it’s easy to be overwhelmed by it, so remember why you’re doing it, think about the end result of being with the person you love. Thanks a bunch Sorrel for coming over to let us quiz you and for your great advice!! If you’d like to find out more about Sorrel and Steve then head on over to their site! Miss out on last week’s “Getting to Know You…”?? Read all about Caroline and Jess from Fox and Partridge right here! Q. Well hello there! How the devil are you? First thing’s first… who are you and what do you do? A. We are Fox & Partridge aka Caroline & Jess (the name is taken from Caroline’s mum’s maiden name and Jess’s second name). We are wedding creatives that can design everything you need for your wedding, from the beginning to end. Invitations, on the day stationery, venue styling, decorations and photography. We have a passion for making sure everything is consistent and that the theme of each wedding flows throughout. Q. And how did you get into the wedding styling business? A. We were both in the wedding industry already (Caroline designs invites with her company Little Lights Invites and Jess is a Wedding Photographer with her company, Jessica Jill Photography). We both knew there was a gap in the market for people wanting a creative wedding but may be unsure of how to go about it. We like to think of ourselves as people who can ‘make your Pinterest board come to life’. Caroline is a graphic designer and typographer, who can design all of your wedding stationery and Jess can capture the day with her 5 years experience as a wedding photographer. Those skills, combined with our love of decoration and venue styling mean we can offer the whole creative package! Q. What do you enjoy most about being the boss at Fox and Partridge? A. The best bit is the research and then finally seeing our ideas and sketches come to life. We also secretly like it when our clients cry when they see the venue and styling for the first time – it usually sets both of us off too! A. Jess: My favourite place I have been to so far is New Orleans (during Mardi Gras) the whole City is vibrant, architecture is beautiful and the food and music is amazing. Caroline: I’ve just got back from Singapore where I spent 10 days exploring the city and helping one of my friends who has just moved there. It’s such a lovely city and you can guarantee you will never ever be cold! A. J:Sundays are spent exploring London with my boyfriend, he is a chef so we tend to check out new restaurants and tick off our list of 100 best restaurants in London, 3 down 97 to go! C: My Sundays either consist of going to visit my parents on the Sussex coast and digging into a home-cooked roast, or going for a walk with my boyfriend before watching a film on the sofa – nothing too strenuous on a Sunday! J: I am addicted to Stranger Things on Netflix, my all time fav movie is The Goonies and this series is a darker version also set in the 80’s. C: I’m looking forward to Strictly being back on TV – I do Latin and Ballroom dancing in my spare time so I’m always watching with interest. I’m never that bothered about the celebrities, I just like watching the professionals do their thing! J: My guilty pleasure song (in the shower) has to be Mariah Carey’s ‘Hero’ song, I know it word for word as I have been singing it since I was 10 years old in the mirror of my old bedroom. C: It’s gotta be Stevie Wonder – Superstition! If I’m cleaning my flat then I have to do it to music and this song definitely gets me dancing! A. J: Ohhh Care Bears were my favourite growing up, I recently shot a wedding where a flower girl gave the bride back her old Care Bear she had given her her and had her dressed up in a wedding dress (the bride cried-and me of course). C: I was more of a My Little Pony sort of girl so I’m going to have to choose Unicorn – plus they’re very on trend right now! Huge thank yous to Caroline and Jess for agreeing to come over and give us the low-down on what they do and the beautiful things that they create! If you’d like to learn more about Fox and Partridge then head on over to their site and check them out! Missed last week’s Getting to Know You…? Not a problem, find out all about The Little Black Crow! Hello hello! Welcome to the first “Getting to Know You…” for September!! Today we’re meeting a coiuple of super lovely ladies who run vintage-inspired planning and styling business The Little Black Crow, come and say hi to Becca and Collette…! A. Our names are Becca and Collette and together we run a small business called The Little Black Crow – event planners and stylists with a flair for vintage! We offer complete Styling for weddings and events, prop hire and full planning. We now also offer catering for vintage and retro tea parties. Q. And how did you get into the wedding and event planning/styling business? A. Collette and I met through our children (we are both lucky to have two beautiful boys) and realised we were both kindred spirits, not only having two boys in common but both had interior design qualifications and had studied at the same college. We also both have a passion for vintage. We were often asked to organise and plan events either for our friends, family or for the school PTA and had helped style parties and weddings. We were both looking for an adventure and so The Little Black Crow was formed! Q. What do you enjoy most about being the boss at The Little Black Crow? A. Who doesn’t love being Queen for the day! I don’t know which one of us is boss, it changes week to week! We do however make a great team as we both are very creative and get excited with ideas but most of all we love meeting all the different people that comes with having this business – so far it’s been a blast! A. Collette: India – For the sense of the exotic, the colours and vibrancy and spice and for the generic Indian smile. Becca: Ooh that’s a hard one… There are lots of places I haven’t been and would love to go to but I think it would be to go on Safari in Africa, I went as a young girl and will always have vivid memories of it, such an exciting adventure and would love to take my boys there and for them to experience the same. A. Becca: On a Sunday my all time favourite thing is to hang out with my family and friends and enjoy a home cooked roast dinner with a cheeky glass of wine. Collette: Picnic on a beach watching my children play by the waters edge. A. Becca: When it comes to TV I love anything weird and wonderful, in fact we both do! Either period dramas such as Downton Abbey to the glorious ‘Penny Dreadful’. At the moment I’m addicted to ‘Somebody Knows My Name’ which has superb acting including Aunjanue Ellis who plays Aminata Diallo. It’s completely ‘heart-stopping’ at times. My favourite book at the moment is ‘Go Set a Watchman’ by Harper Lee . Collette: We both have the same taste when it comes to TV. I’m currently reading Senior Vivo and the Cocoa Lords. A. Is that a trick question? Of course it has to be a Unicorn – a beautiful, mythical beast! That made us think of the make up bag Collette bought me which had written on it “My friend told me I was delusional, I almost fell off my Unicorn!” Sums our humour up perfectly! A. Our advice for brides and grooms is to make your day personal and unique to you as you can’t please everybody so choose what’s best for you and don’t worry about it not being ‘the norm’. Using a stylist can be a lot more affordable than you think and will ensure that you having a setting that reflects your personality and suits who you are as well as taking away a lot of the stress and hard work! Another tip is to have an Afternoon Tea for your wedding breakfast as it is a great way to feed your guests and looks fantastic too but it will cost less than a traditional 3-course meal. A big, big thank you to Becca and Collette for coming over to the blog today and giving us a little inside snoop into their lives and business! If you’d like to find out more then check out them out here! Did you miss our last “Getting to Know You…”? Check out Daisy from Daisy Sheldon Embroidery! We kicked off last weekend with a boom! It was a bank holiday here in the UK on Monday… that means a three day weekend!! Whoop whoop! That usually means a rainy barbecue but it was actually really rather pleasant! 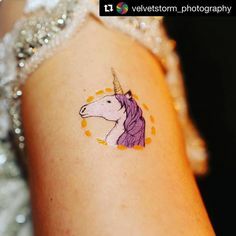 The fabulous Victoria of Victoria Lily Events got her self inked-up with one of our temporary tattoos at a recent wedding and we think she looks fab! What do you guys reckon to a cheeky hand tattoo? This rocket design is one of our faves! And no week would be complete without a little bit of whimsy, right? What better way to make a statement at your themed party than by spelling it out in lights? What do you think about our topic theme of choice? We were super chuffed to see our Temporary Tattoo Station in a Box pop up over on Perfect Wedding back in December in their feature “10 Amazing New Wedding Entertainment Trends for 2016“! A great read for anyone looking for something a bit different to entertain their guests! Be sure to be following us over on Instagram (@hellodorisloves) so you don’t miss out on anything! Morning Doris Lovers! Happy weekend… happy bank holiday weekend, in fact! It’s going to be a great few days, who’s got exciting things planned? We’ve had a great week here with some beautiful shares and lovely reviews… receiving such positive feedback always makes us feel super! Pow! Having trouble deciding whether to have your initials or our classic ‘LOVE’ for your special day? Why not treat yourself and have both? With our battery-powered letters the possibilities are endless… hold them in photos, place them on the dance floor… move them around throughout the day… the choice is yours! This week’s brand new “Getting to Know You…” featured super embroider and all-round lovely lady, Daisy from Daisy Sheldon Embroidery. We highly recommend if you’d not seen it already, that you pop on over and check it out as her creations are mind-blowingly beautiful! We received this lovely review earlier on in the week and we couldn’t resist sharing! We don’t like to brag but certainly making people so happy does make doing what we love that little bit more special! Thank you for the kind words Rich and Amy! The lovely Jon and Jo shared this beauty of a photo over on our Facebook page this week and we couldn’t resist showing it off! Having your surname is a great alternative to your initials and we think that this black and white shot is just perfection! Thank you for sharing Jon and Jo! Pow! A great way to start or finish any week! Whilst we were flying high in our super mood we came across this and thought it was absolute perfection… if you can’t be true to yourself on your wedding day then when can you be? This superhero theme bouquet by Laura from Potts of Love and featured on The Sussex Bridal Planner is amazing! Be sure to be following us over on Instagram (@hellodorisloves) to keep up to date with all that we get up to in the week, plus our offers and news! Hello hello! Happy Tuesday! We’ve got something a little bit unique and special for you this morning… something for those of us that like things a bit old school and definitely beautiful! We’d love for you to meet lovely Daisy from Daisy Sheldon Embroidery and her beautiful creations! Read on to learn more and see some prettiness! A. Hi there! I’m Daisy! I am an embroiderer, specialising in bridal & lingerie and also offer embroidery services for film, theatre and fashion. My bespoke bridal veils push the boundaries of the conventional bride and are unique and personal to each bride. The embroidery techniques I use allows me to create anything I would like on fabric – I had one bride recently who was an English Literature student and loved cats, so I embroidered cats and books onto her veil! I use old, specialist embroidery machines, including the Cornely, a beautiful 1920’s machine which creates a decorative chain stitch and the Irish, a freehand embroidery machine which ‘draws’ with stitch, as well as embellishing with hand stitching and beading. I am proud of carrying the banner for a craft that could creep into decline and keeping alive British craftsmanship. Q. And how did you get into the embroidery business? A. I studied BA Hons Embroidery at Manchester Metropolitan University and it was there that I discovered the Cornely and Irish machine. I totally fell in love with them and after I graduated I did various work placements with companies and people such as Karen Nicol and Phillipa Lepley Couture. It was there that I found the world of bridal wear and loved the idea of creating a beautiful piece of work that would be a treasured heirloom for years to come. Then came my own embroidery business ‘Daisy Sheldon Embroidery’ ! Q. What do you enjoy most about being the boss at Daisy Sheldon Embroidery? A. I love that I can manage my own time – often creativity doesn’t work 9-5, so if I have an idea or inspiration late at night I can just pop into my studio and get really creative! A. Japan! I have always wanted to visit Japan – a lot of my work is inspired by traditional Japanese paintings and textiles, so would love to explore and see the culture there! A. Scouring flea markets and vintage shops for treasures! I come from a family of collectors and we love surrounding ourselves with objects we find aesthetically pleasing – like an eclectic cabinet of curiosities! A. Game of Thrones! Daenerys Targaryenvis amazing. I love her long mermaidy hair, her strong independence and her style – arm cuffs all the way! A. I love listening to soundtracks of musicals I have been part of. I recently worked on the embroidery for Disney’s stage production of Aladdin and went to see it, which was fantastic! Putting on ‘Friend like me’ or ‘Prince Ali’ while I work brings back wonderful memories of the show and all the hard work and effort everyone put into making it. A. 100% a unicorn! They are so majestic with their beautiful flowing hair and magical qualities. A. My advice for planning your wedding day would be to enjoy the process! I know there is so much to organise and it can be stressful at times, but it isn’t often that you plan a wedding so relish the time and adventures it takes you on! Remember what the wedding is all about and trust that it will all come together beautifully in the end. A mahoosive thank you to Daisy for coming over to tell us all about herself, her business and her exquisite craft! A bespoke embroidered veil is a truly magical keepsake from your special day! Fancy learning more? Pop on over to Daisy’s site! Missed last week’s “Getting to Know You…”? Fear not, we’ve got your back!! Here’s Nikki from Fiesta Fields! Who doesn’t love a cute little cactus? We certainly are big fans here at Doris Loves HQ! You know we love a little bit of sharing here at Doris Loves and in the last couple of weeks we’ve seen some great snaps sent in by you lovely lot! Here’s our temporary tattoos in action plus a super unique way to use our light-up letters! They look great up there! We’ve been super lucky enough to have a couple of great ladies feature on our weekly feature “Getting to Know You…” recently. First of all we had Emma from Tigers to Lilies and then Nikki from Fiesta Fields! We’re incredibly proud here at Doris Loves to offer you variety and something a little bit different… that’s why we’ve got plenty of options when it comes to things to go with your letters? Don’t fancy the classic ampersand? How about a little love heart instead? Or why not pop and exclamation mark on the end of a word to really make it pop? Our light-up letters got their moment in the spotlight this week after featuring on British reality TV show “The Only Way is Essex” at a Circus-themed bash! And that’s us all caught up from the last two week! Yay! Lovely wedding planner Bride and Glory included us in their photo round-up of their busy weekend of weddings over on Facebook. And our balloon-tastic lovely Pop Pop Papier shared one of our recent photos that features one of her super glossy and fantastic creations over on Facebook! Don’t forget to make sure you’re following us over on Instagram (@hellodorisloves) to keep up with all of our adventures! Aaaaand hello again! Welcome back to the Doris Loves blog for another week of “Getting to Know You…”! Today you may well recognise the lovely Nikki and her business Fiesta Fields as they featured here on the blog earlier in the year with Nikki’s real wedding featuring our light-up letters! So we won’t ramble on any further… on with the show! A. Hello, I’m Nikki and I own Fiesta Fields. We source and manage venues for landowners who are wanting to make their land available for hire for weddings, outdoor celebrations and glamping parties. We also use our knowledge and experience to help clients put on their event, relieving (hopefully) some of the stresses that come with this kind of event. Q. And how did you get into the wedding venue business? A. In summer 2014 we booked a field for our wedding and the landowner said he was keen to promote his site. I thought I would have a go at marketing the location, so I worked on a proposal and he was keen to give it a go. I spent a couple of months building my website – when I should have been planning our wedding – and in November 2014 Fiesta Fields was officially born. Q. What do you enjoy most about being the boss at Fiesta Fields? A. Meeting some lovely people and the satisfaction of having played a part, however small, in creating some amazing memories for them. I also enjoy collaborating with all the fab suppliers out there. It’s such a friendly, creative and down to earth industry to work in. A. Ooh, with kids or without? With, it would be Sardinia, amazing beaches and food and less than 2 hours flying. Without, Borneo, it was next on the list before I fell pregnant. We will go there one day, but when they are older, we’re not that brave! A. Lie in, nice brekkie, sunny walk in the countryside and a leisurely lunch at a pub with friends while the kids play happily in the beer garden. A. Yes! Nashville. My husband got hold of the next series ahead of time. Good music and eye candy, the perfect combination. I used to love reading and am looking forward to reading another one some time in the next 5 years! A. Steppin’ out, Joe Jackson. A. Hmm, can I be a fraggle instead? I would be Red. “Dance your cares away, worries for another day….” Am I showing my age? A. Don’t be guided by tradition or others. Do whatever suits the the two of you. Dream big, be creative and accept Pinterest as your best friend for the next year or so. Big thanks to Nikki for coming on board to let us in on all the goss’ from Fiesta Fields! If you’d like to learn more then pop on over to their site and check them out! Why not also swing by Nikki’s real wedding blog post to have another look at Fiesta Fields in action (it’s a super dreamy wedding, FYI)! Did you spot our luxury LOVE letters hiding in the background in one of the pictures? You can have a jolly good look at them here! Oh no! You didn’t miss last week’s “Getting to Know You…” did you?? You’d best take a look… it’s Emma from Tigers to Lilies! Hello hello! Welcome to our latest edition of “Getting to Know You…” and today we’d love to show you some fabulous florals! We’d like to introduce super lovely Emma from Tigers to Lilies but don’t listen to us… read on and find out for yourself! We feel we should warn you though… the following contains some serious unicorn-related-amazingness. Consider yourselves warned!! A. Hey – I’m Emma, a floral artist and owner of Tigers To Lilies, an Events and Wedding Florist business with workshops in Sussex and London. We do everything floral from weddings to large scale corporate events and fashion editorials. Flowers represent colour, nature, freedom and creativity; all my favourite things in life. Running my own florist business gives me the opportunity to work in a business I truly love. I love meeting couples and chatting to them about their Big Day – I see my job as translating the ideals of the couple into creating unforgettable flowers for their day. Q. And how did you get into the fabulous floral business? A. Ever since I was small and discovered Play Doh I realised I wanted to work with my hands in a creative way. I grew up helping my grandma with her garden and knew early on working with nature was the way to go. I was lucky enough to work freelance with some top London florists, where I enjoyed myself so much I started my own successful flower business in the City, before moving to beautiful Sussex. Q. What do you enjoy most about being the boss at Tigers to Lilies? A. Being the boss of Tigers to Lilies gives me the free reign to be as creative as I would like. Freedom is the word I think of immediately – freedom to make decisions on how the shop looks to what flowers to buy in the morning at the flower market. I love the sense of satisfaction I feel whenever I make anything floral from a buttonhole to decorating a stag head. Tigers to Lilies flower style is gardeny, natural and raw with a touch of the wild… I love using seasonal British foliage, especially herbs, seedpods, berries and grasses. A. That’s an easy one… Big Sur, California. I stayed in a yurt there a few years ago and it was truly beautiful. A. Walking my dogs across the South Downs or the beach and then having a Bloody Mary with pancakes and maple syrup. A. I love Peaky Blinders – who doesn’t enjoy watching Cillian Murphy?! A. It would have to be the Ace of Spades by Motorhead played very loudly. A. A unicorn is close to my heart as at the last wedding I worked on I decorated a Unicorn with a floral garland which was featured in Rock n Roll Bride. A. When choosing a supplier (particulary a florist!) look at their instagram and website – really get a feel of the style of work they create. If you like what you see, share your vision with them… a pic of the dress, the venue or a photograph… then planning the wedding becomes like a stone gathering moss… the Big Day will be beautiful! Huge thank you to Emma for agreeing to come on over to our blog today and take part in us being super nosey! If you’d like to learn more about the beautiful floral stylings of Emma then head on over to the Tigers to Lilies site and have a snoop! Did you miss last week’s “Getting to Know You…”?? Not to worry, we’ve got you covered! Check out John and Aaron from Gin and Bear It!